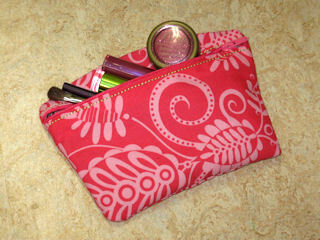 Very Useful with LEAK PROOF LINING Cosmetic Bag! Fantastic craft sale item! Very quick to make for very little money invested! 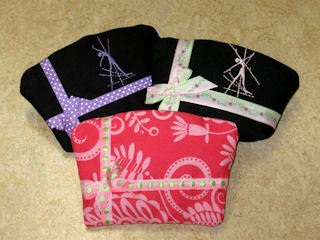 Do you have a quick and inexpensive gift to make? Do you sell items at craft sales and bazaars? This one is for you. 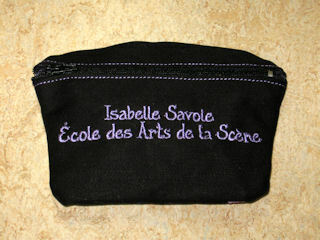 This cosmetic/jewelry bag is completely stitched in the hoop. 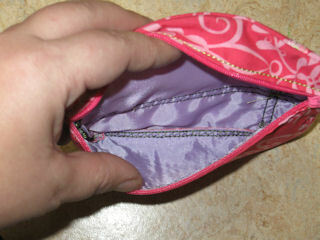 2 variations are included to allow the use of 3/8" ribbon or 5/8" ribbon. 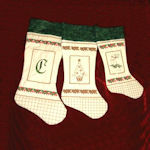 You also have the choice of leaving it blank or you can decide to monogram or embroider or add sparkles. Embroidery areas on the front and on the back have been included to make it easy to figure out where to place the embroidery without touching the ribbons or have the design partially disappear in the seams. A very detailed instruction file with photos at every step is included with the designs. 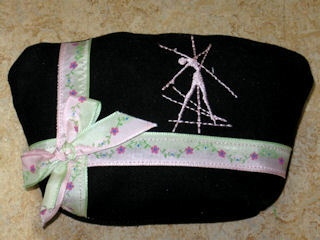 Note, the cosmetic bag is entirely finished inside and out in the hoop, including putting in the zipper, the ribbons and the "serging" stitches to finish the seams on the inside. 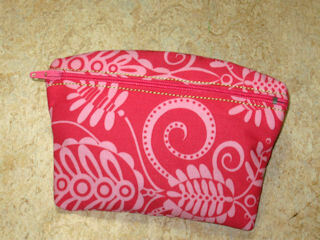 This gives you a professionally finished cosmetic bag. 3/8" ribbon and another to accomodate 5/8" ribbon. thread color to create varied effects. Ah! The freedom to choose our own fabrics. The lining is leak proof to protect from messy spills. All seams are finished. No fraying! will fit in this little jewel. 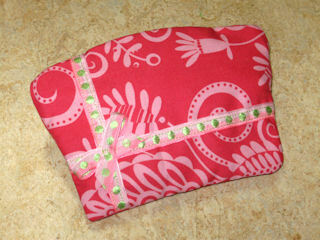 This little bag is really quick to make. Note: The ballerina is not included. easy it is to customize this bag. I got 50 made in 3 days! Note: The lettering is not included. 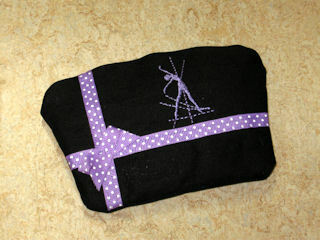 Finished Size of case: 6 1/4" x 4 5/8"
This design can be sized up or down very easily to accomodate your needs. Only outlines were used, so you shouldn't encounter any issues in resizing. 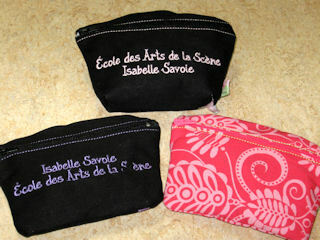 All the inside seams are finished as if done on the serger!